Issued at 9:00 pm. today, November 7, 2013, the Philippine Atmospheric, Geophysical and Astronomical Services Administration (PAG-ASA) forecasts that the eye of Typhoon "YOLANDA" was located based on all available data at 338 km East Southeast of Guiuan, Eastern Samar (10.2°N, 128.7°E ). Eastern Visayas, Masbate, Dinagat Province, Northern Cebu including Cebu City and the islands of Bantayan and Siargao will experience stormy weather with rough to very rough seas. The rest of Bicol Region, MIMAROPA, the rest of Central Visayas, Western Visayas, Southern Quezon, Camiguin, Misamis Oriental and the rest of Caraga will have rains with gusty winds with moderate to rough seas. The rest of country will have cloudy skies with light to moderate rainshowers and thunderstorms. Moderate to strong winds blowing from the northeast will prevail over Luzon and Visayas and the coastal waters along these areas will be moderate to rough. Elsewhere, winds will be moderate to strong coming from the northeast with moderate to rough seas. 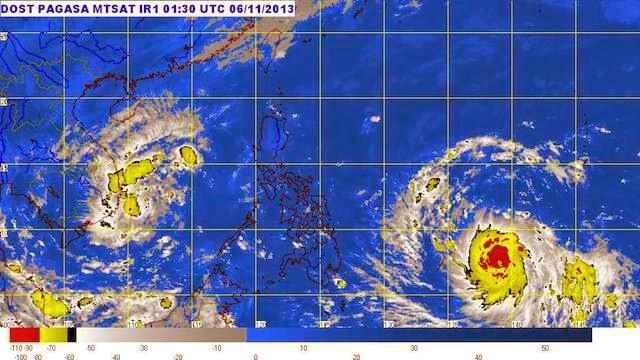 Typhoon "YOLANDA" has maintained its course and intensity and continues to threaten Eastern Visayas. "YOLANDA", after hitting Guiuan ( Eastern Samar), is expected to traverse the provinces of Biliran, the Northern tip of Cebu, Iloilo, Capiz, Aklan, Romblon, Semirara Island, the Southern part of Mindoro then Busuanga and will exit the Philippine landmass (on Saturday early morning) towards the West Philippine Sea. Estimated rainfall amount is from 10.0 - 30.0 mm per hour (Heavy - Intense) within the 600 km diameter of the Typhoon. Sea travel is risky over the seaboards of Northern Luzon and over the eastern seaboard of Central Luzon. Residents in low lying and mountainous areas under signal #4, #3,#2 & #1 are alerted against possible flashfloods and landslides. Likewise, those living in coastal areas under signal #4, #3 and #2 are alerted against storm surges which may reach up to 7-meter wave height. The public and the disaster risk reduction and management council concerned are advised to take appropriate actions and watch for the next bulletin to be issued at 5 AM tomorrow. - If this post is not yet updated as of this time, please visit PAG-ASA's website here.